Katie Scharf Dykes is the Commissioner of Connecticut’s Department of Energy & Environmental Protection (DEEP). She was nominated by Governor Ned Lamont to serve as the Commissioner of DEEP, and was confirmed on February 20, 2019. Katie previously served as Chair of the Connecticut Public Utilities Regulatory Authority (PURA) from 2015-2018, and as Deputy Commissioner for Energy at Connecticut DEEP from 2012-2015. Katie also served as the Chair of the Board of Directors of the Regional Greenhouse Gas Initiative, Inc. (RGGI) from 2014 to 2017. RGGI is a multi-state effort focused on reducing carbon emissions from electric generating facilities. Katie joined CT DEEP in March 2012 after prior service as Deputy General Counsel for the White House Council on Environmental Quality and as a Legal Advisor to the General Counsel for the U.S. Department of Energy. She is a graduate of Yale College and the Yale Law School. Yvonne Bolton has worked at Connecticut DEEP since 1985 and is currently chief of the Bureau of Materials Management and Compliance Assurance. She oversees a wide variety of program areas including regulation and legislative development, coastal permitting and enforcement, solid and hazardous waste permitting, agency data integration and information management, and water quality management. Bolton is responsible for the bureau’s industrial, stormwater, and subsurface discharge programs; materials management programs; and emergency response and spill prevention programs. She has a J.D. and an M.A. in Environmental Law from Vermont Law School and a B.S. in Environmental Conservation from the University of New Hampshire. As director of Connecticut DEEP’s Water Planning and Management Division, Denise Ruzicka is responsible for oversight and funding of municipal wastewater treatment plants and water quality assessment, standards, and protection programs. She is a licensed professional engineer in Connecticut and has 30 years of experience in water resources management and public water supply planning. Ruzicka serves as chair of the State Board of Examiners of Environmental Professionals (LEP Board) and as the governor’s appointee to the Interstate Connecticut River Valley and Thames River Valley Flood Control Commissions. She is a graduate of Dartmouth College. 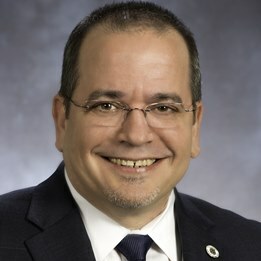 Dr. Raul Pino is commissioner of Connecticut’s Department of Public Health. Prior to his appointment in February of 2016, Dr. Pino served as deputy commissioner and then acting commissioner of the agency. Previously, Dr. Pino served as director of the City of Hartford Department of Health and Human Services and as an epidemiologist for Connecticut DPH’s STD Unit. He graduated from the University of Havana with a Doctorate in Medicine, and from the UConn School of Medicine with an M.A. in Public Health. A Connecticut DPH employee since 1997, Suzanne Blancaflor has served as the public health section chief for the environmental health section since 2008. She oversees a staff of 52 and manages eleven environmental health programs including private wells, environmental engineering, environmental laboratories, lead-poisoning prevention, and licensing of environmental practitioners. Blancaflor holds an M.S. from Eastern Connecticut State University and an M.P.H. from Southern Connecticut State University, and serves as an adjunct professor at both. Michael joins the Commission with more than 45 years of professional municipal government experience in water pollution control and solid waste disposal management. Michael is presently serving as Superintendent of Sanitation for the Town of Glastonbury, Connecticut, and has been managing the Towns Water Pollution Control and Solid Waste/Recycling Divisions since 1993. Michael currently serves as Chairman of the Capital Region East Operating Committee and the Central CT Solid Waste Authority, managing regional hazardous waste and statewide waste disposal/recycling initiatives and programs. Michael was the past President of the CT Water Pollution Abatement Association (CWPAA) and former New England Water Environment Association (NEWEA) Connecticut State Director, and continues to serve as CWPAA Executive Board Member and NEWEA Government Affairs Committee. Recipient of Water Environment Federation, William D. Hatfield, NEWEA Clair N. Sawyer and Operations awards. Denis Cuevas has worked in the public sector for over 20 years and serves as General Manager of the City of Waterbury, Water Pollution Control Department since 2009. He is the current President of the Connecticut Association of Water Pollution Control Authorities (CAWPCA). His experience has focused on managing the Water Pollution Treatment Facility with a design flow of 27 million gallons a day, collection system that includes 20 pump stations and 330 miles of collection system infrastructure. He is responsible in managing the design and construction of wastewater infrastructure projects including the phosphorous reduction project currently under construction. Denis graduated with bachelor’s degree in civil engineering from University of Connecticut and is a licensed Professional Engineer in CT.
Jane Stahl has over thirty years of experience as an environmental policymaker, regulator and consultant. As Deputy Commissioner of the Connecticut Department of Environmental Protection, Ms. Stahl was responsible for the State’s Air, Waste, Water and Long Island Sound Programs. She now brings the breadth and depth of knowledge acquired through her leadership of those programs to private and public entities engaged in project development, permitting, enforcement, rulemaking and policy development issues in the realms of energy, environmental protection and natural resource management and land use. Though it seems like ancient history, Ms. Stahl received a B.A in Environmental Studies from the State University of New York (SUNY) Stony Brook, an M.S. in Natural Resource Policy and Management from the University of Michigan, and her J.D. from the UConn School of Law.